Earlier this week Google rolled out Search Plus Your World. In short, this development features personalized results from your contacts – which may be images, shared posts, or pages that have been given a +1 by your contacts; or even pages on Google+ that you may not be connected to. Search engines like Google or Bing don’t make changes to results types, presentation styles, or other quality factors on a whim. Numerous methods of testing and data-modeling are available and when you have the query volumes of Google, “statistically meaningful” isn’t something you need to wait a while to accrue. There are many reasons this is a beneficial move for Google. While many general users may trust search engine results, more experienced web users are becoming increasingly disenchanted with result-quality. As far back as 2009 data studies such as a Nielsen report put recommendations from known contacts and consumer opinions way, way ahead of search engine advertisements. Google themselves talk more often about the importance of engagement metrics and explicit user feedback, with the Panda update of 2011 being the first algorithm update to openly factor user feedback. In addition this post on Google Webmaster Central clearly explains that improving the click-through rate (CTR) engagement metric is the reason for their re-writing page titles in search results. External data sources and search engine product development then, both clearly point towards a greater degree of personalization as having a positive impact on user-engagement. It stands to reason that as technology and platforms evolve why wouldn’t a search engine seek to provide results that replicate human behavior. We develop social groups; we attract and are attracted to people we may respect for one reason or another that is personal to us. I’m much more inclined to give credence to the opinion of someone I rate, as opposed to someone I’ve never heard of; particularly when it comes to searches related to my work. Google needs greater growth for Google+, as the more People and Pages, the more content shared, the greater the activity levels, the more effective and beneficial the service becomes to users and so on, ad infinitum. For logged in users, if I’m seeing relevant results from people I know, there’s instantly a greater incentive for me to connect with more people on Google+, particularly as there’s a notable absence of ‘Search Plus Your World’ results from platforms such as Twitter and Facebook; which brings me to the most public critique of this development – the response from Twitter. “For years, people have relied on Google to deliver the most relevant results anytime they wanted to find something on the Internet. In response to the Twitter statement (delivered on Google+) Google have tried to pass the buck for this results bias, by placing the blame with Twitter, for failing to renew their agreement to provide their firehose to Google. It seems that the implication is to be given credence in ‘Search Plus’ results, other social platforms need to provide greater access to their data. Google has even rushed to put together this page compiling quotes and praise about how great and pure Google’s Search Plus Your World is. “Our social strategy does not require the acquisition of any company, because we can get people to give us that information”. I refuse to believe that observing a rel=nofollow prevents the indexation of Twitter content and the response to Twitters position in Google+ smacks more of sour grapes than of anything else. Particularly so when you consider the prime piece of SERP real-estate afforded to Google+ for some queries even when I’m logged out. Despite being labeled “Search Plus Your World”, I am also presented with new Google+ results for “People and Pages on Google+ related to [query]” – when I am logged out and in incognito mode. I fail to see how in this instance these results are of any relevance to me. There is no circumstance whatsoever in which I would consider Paris Hilton, Kim Kardashian or Mariah Carey to be relevant to the query “actress”. Nor would I expect Wil Wheaton to feature in the top three results for “writer”, “author” and “actor” (note: there are no Google+ results for Sheldon Cooper’s nemesis). Top three for that, I could have swallowed. Of course Google+ is as of yet, a (comparatively) small paddling pool of profiles and connectivity data, and certainly the algorithm that governs People and Pages suggestions when logged out seems to be crude. 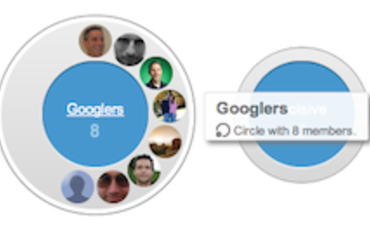 Based on observations of the twenty or so searches I have found that produce results the main factors are numbers of circles in which the Person/Page is included, combined with matching keywords on the /about page of the Google+ Profile. Is Search Plus Your World Bad for Users? Twitters’ position is clear, that Search Plus gives an unfair amount of discovery to Google+. I’ve seen countless tweets such as the above, and even stronger positions from contacts that have deleted their Google accounts in protest. Of course my social circles are very search literate and well-informed compared to the average user. That aside, the presentation of Google+ People and Pages to certain queries (to logged out users) seems particularly unfair and anathema to the very principles of discovery on which a search engine should be concerned with. To my mind, I’d agree this seems somewhat unfair and unbalanced credence to Google properties. I’m also reminded of the warnings of Eli Pariser in his book “The Filter Bubble: What the Internet Is Hiding from You“. In his book Pariser examines the data-types and levels of information that search engines and social networks routinely collect about users, which is used to serve up content and experiences that is determined to be most relevant to us according to our networks, age, social group, income and more. Such social networks therefore act as a “filter bubble” – an enclosed world of ringfenced content and experience – with the conclusion being this negatively impacts discovery, diversification, originality, conflicting opinion, healthy debate and disagreement. While in some parts I find this type of search personally useful, I’m concerned about a future search experience that is shifting away from pure information retrieval, to curated information retrieval. My concern is who is curating, based on what data and what commercial motives? Trust me; ultimately commercial motives underpin how any commercial product evolves. That Google+ or organic search results are not directly commercialized is immaterial.